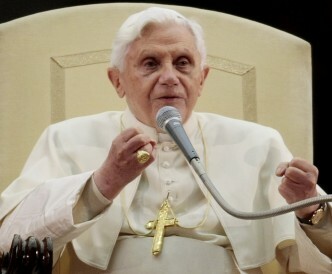 Pope Benedict XVI told French Bishops recently that they must do everything they can to resist gay marriage as it “threatens” society, going on to imply that gay people aren’t fully developed humans. The Pope’s comments were made during a September 21 speech at Castel Gandolfo, whereby he reportedly told his assembled religious brethren that “The family is threatened in many places by a faulty conception of human nature.” Some translations have him saying the word “defective,” in fact. Posted September 28th, 2012 & filed under News.